The RCC2V2A1C6HDE cable is hybrid a/v multi-core cable with an added category 6 element for networking and data transfer in remote production and ENG applications. 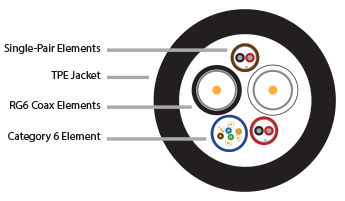 Each video element is a CD7506 18AWG RG6 HD/SDI coax that is rated to 4.5GHz for high definition SMPTE 424M, 292M and 259M video data transmission. The audio elements are made from Clark's SPA22GS low-loss 22AWG single-pair cables. All elements are uniquely color coded for quick identification and the outer jacket is extruded from a TPE compound that is extra-flexible, rugged and abrasion resistant. PVC Pair Jacket .132" O.D. Gas-Injected Foam PE, .180" O.D. 1 Blue .720" 240 lbs/Mft 7.2"
Impedance Return Loss DC Resistance Operating Temperature Capacitance Velocity of Prop.